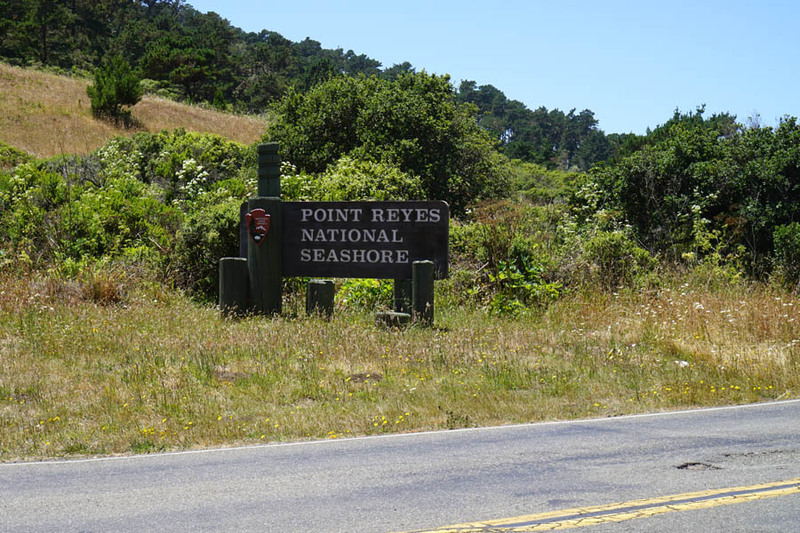 I cannot believe I waited this long to visit the Point Reyes National Seashore! I have lived in California almost my entire life, except for the four years I was in the Netherlands. 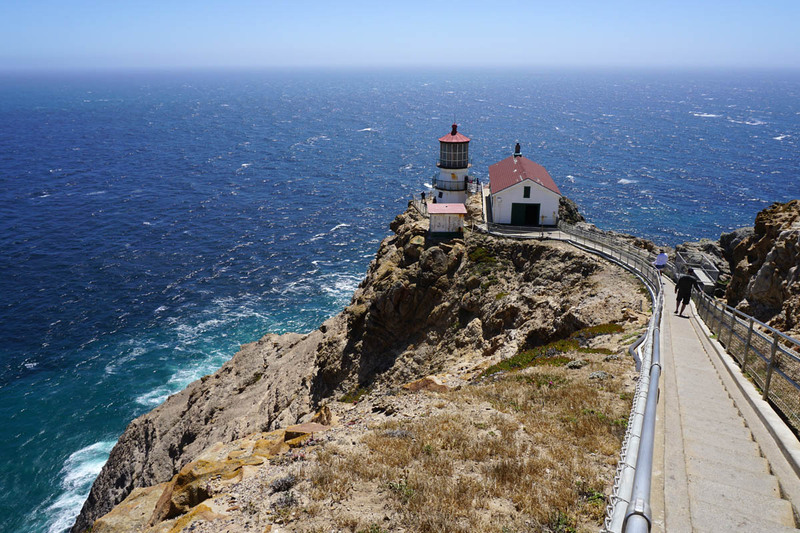 Yet, I never even thought about taking a mini road trip to Point Reyes area before. It’s only two hours away and there’s so much to see! I’m so happy that my partnership with Cape Cod Chips gave my family a reason to check it out! 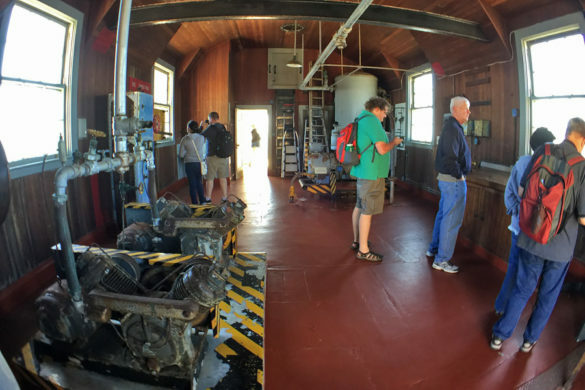 Before we started to explore, we stopped in at Point Reyes Station. This “cute little town” (as Munchkin referred to it as) sits right at the entrance to Point Reyes. 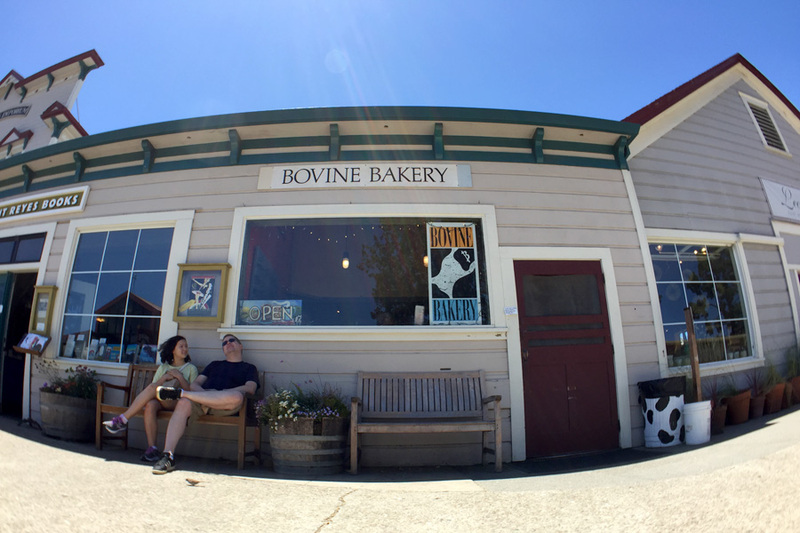 Bovine Bakery is a local favorite for good reason. The food and treats were delicious. Frans even had a nice selection of gluten-free baked goods. Then, we popped around the corner to Cowgirl Creamery for in-house made cheese. 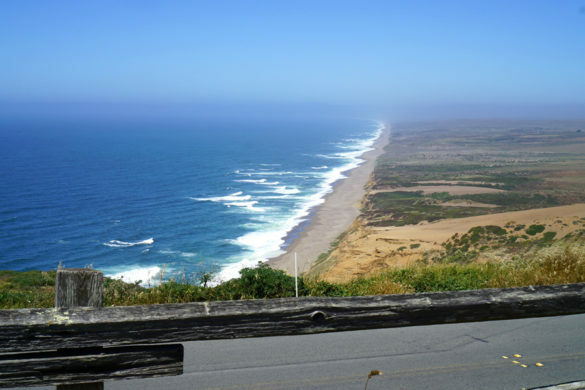 From there, we drove to the Point Reyes National Seashore. The windy route took another hour but was worth the drive. 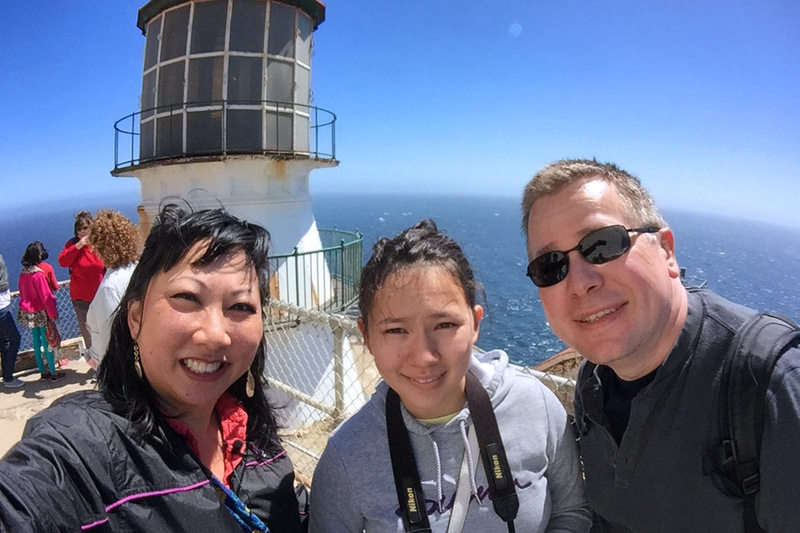 We had a blast along the route to the Point Reyes Lighthouse. Even at the higher altitudes, we saw a ton of sand dunes and free-grazing cows by the seaside cliffs. It was pretty funny how they would watch us drive by. 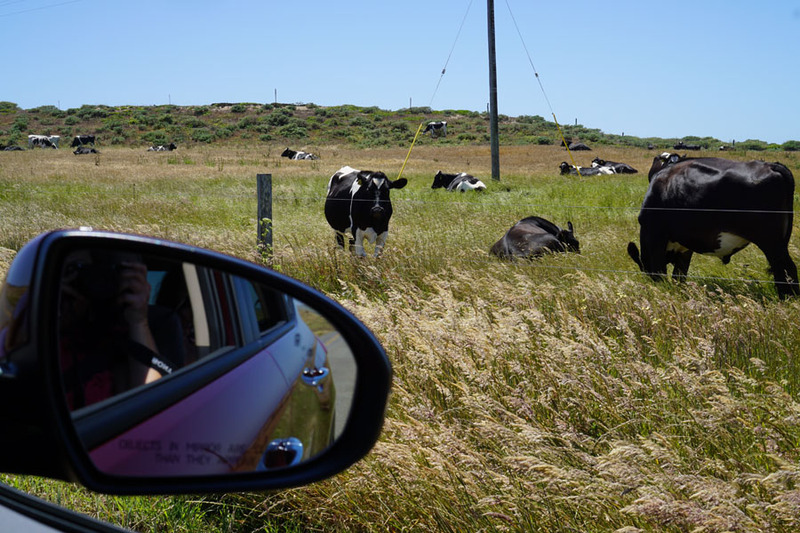 Such happy California cows! The lighthouse looked so picturesque against the rocky cliffs and jewel-colored ocean waters below. 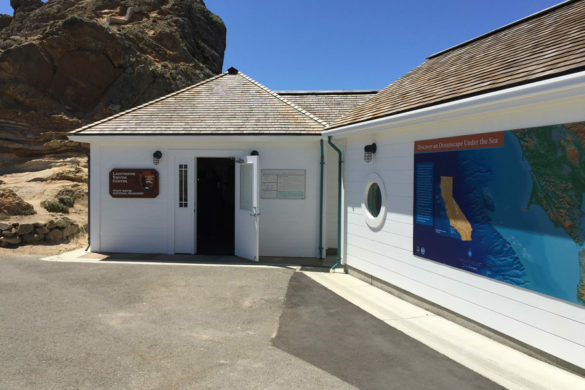 The Point Reyes Lighthouse and Visitor Center is only open Friday to Monday. Also, the walkway to the lighthouse will close if it gets too windy. 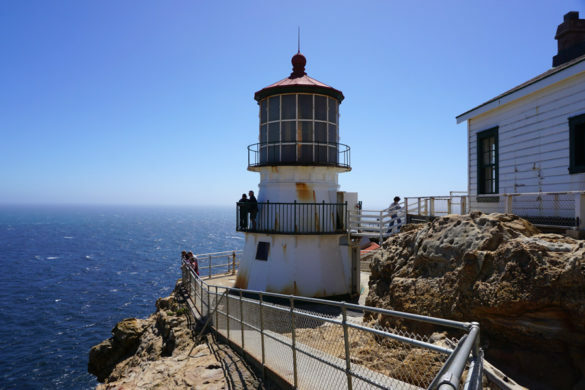 It is a trek to the lighthouse so give yourselves at least a couple of hours to get there and back. From the parking lot, you have to walk up the hill for a half-mile to get to the visitor center. We caught some gorgeous views of the seashore as we made our way over. 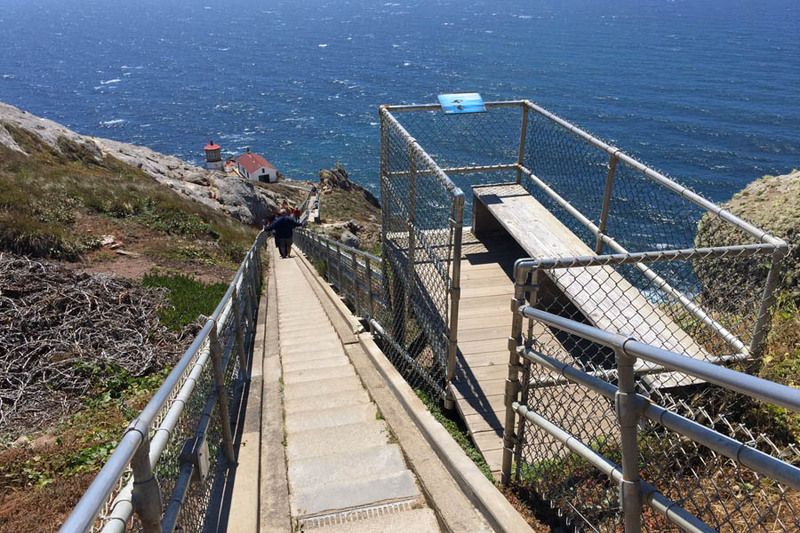 You can see the lighthouse from the upper observation deck. 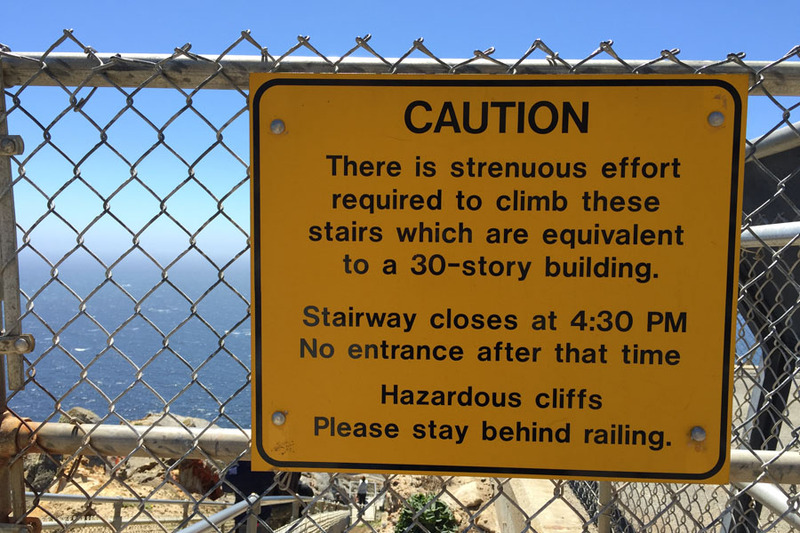 But, you’ll get better pictures if you actually descend the long staircase. There are 308 steps to the lighthouse (yes, they are numbered), which is a height difference of about 30 stories. It’s not too bad on the way down but, on the way up, it’s a killer. 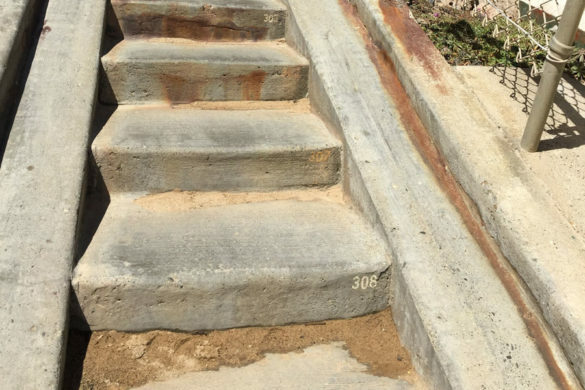 The stairs are somewhat narrow so you can’t take normal strides. Your calves and thighs will be burning like there’s no tomorrow. Even the kiddies will ask to rest here and there. 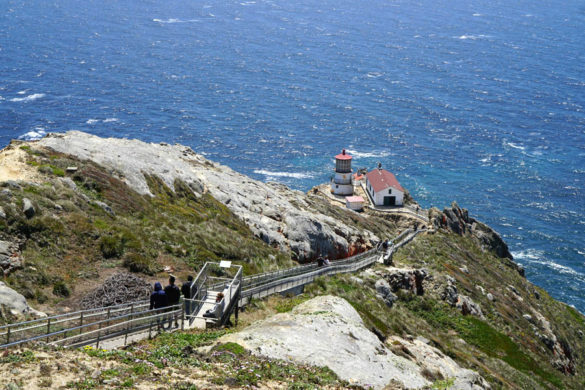 The Point Reyes Lighthouse itself is a testament to an era long gone. The ranger on duty was giving informative 20-minute sessions of the lighthouse history. 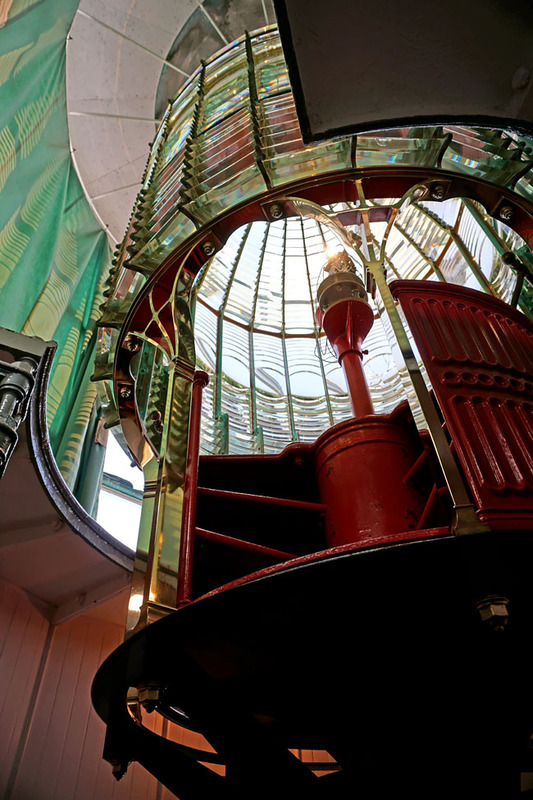 The lighthouse opened in 1870 and features a revolutionary Fresnel lens. What’s remarkable is that the original mechanical gear system and counterweights are still functional. The area is small so prepare for some tourist congestion. After snacking on some Cape Cod chips (which were perfect after our hike), we set out to explore more. 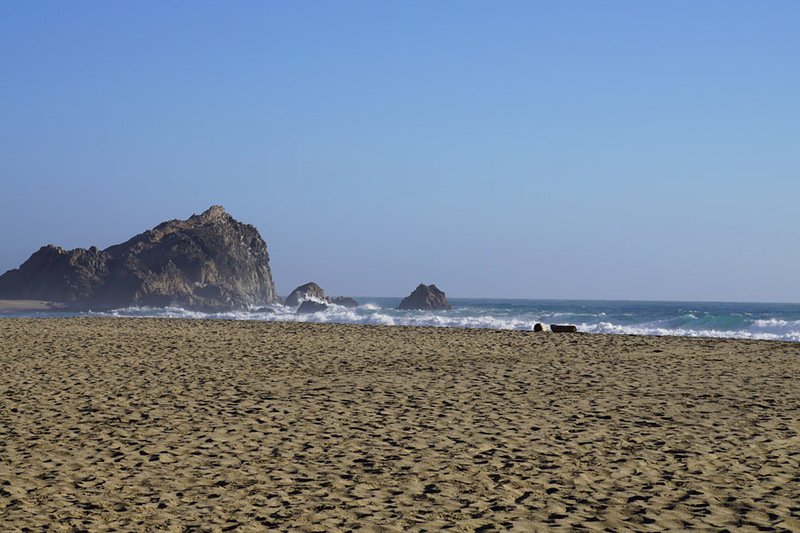 We stopped by Drake Beach and then took another half-mile hike down to McClures Beach. Both were breathtaking and with little to no other people. We would have loved to spend a few hours relaxing at either of these beaches but it was getting late. We also made our way to the Tule Elk Reserve. It was amazing to see wild dozens of Tule Elk roaming the hillside. Before we knew it, the sun was setting. There was still so much more we wanted to do but didn’t have time. At the Bear Valley Visitor Center, you can tour the Earthquake Trail to learn about the fault lines in the area. 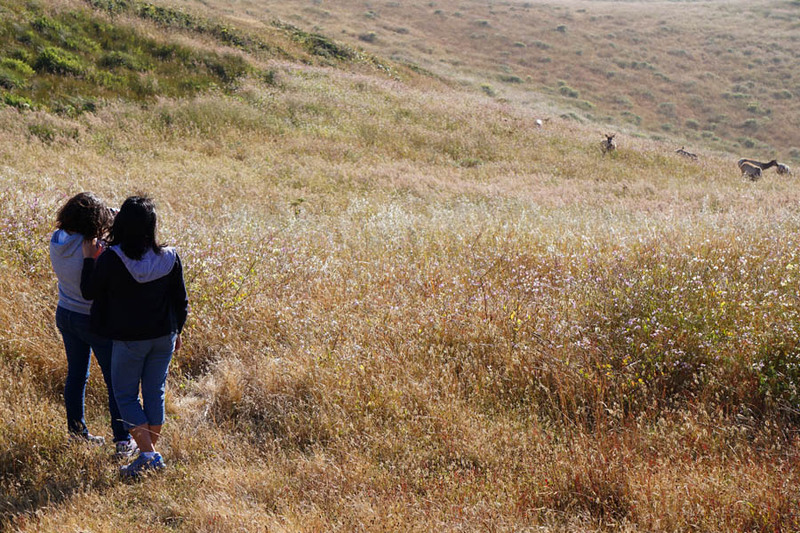 Or, there’s the path that brings you to a re-created Miwok village. Then there are the many hiking trails, beaches, and lakes that abound in the area. We definitely need to visit again soon! 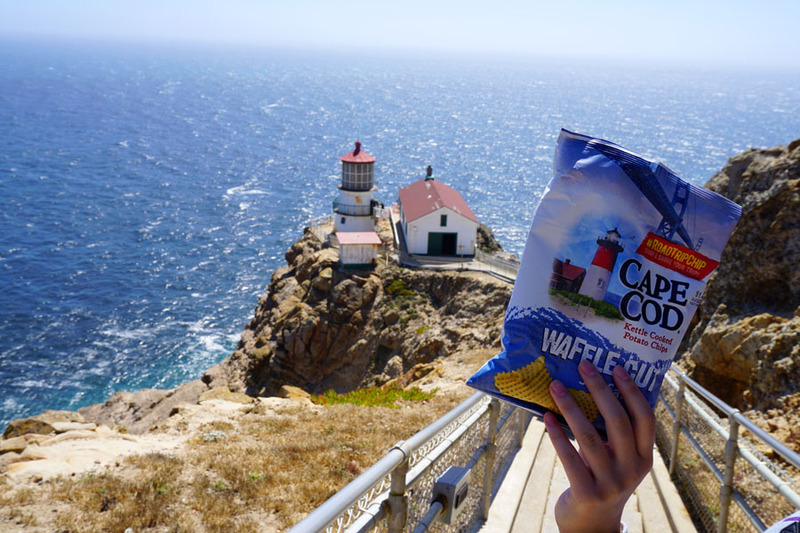 We had such a fantastic road trip to Point Reyes National Seashore with Cape Cod Chips. They’re full of flavor and gluten-free. It was so nice to have these to snack on while we were out and about. You should go on a road trip with Cape Cod Chips too. Just snap some photos and share them using the hashtag #RoadTripChip. You might just get a surprise. Also, in honor of my #RoadTripChip visit and to encourage you to take one of your own, Cape Cod Chips is offering a special prize pack. One of you can win a variety pack of these chips to bring on your next summer road trip. You’ll love having some to munch on too. Enter below! What road trips will you take this summer? I was compensated to take my own #RoadTripChip with Cape Cod Chips. All opinions are my own. I’d love to go to visit my brother in California! I would like to go to San Diego, CA. That looks like fun! I would like to go to Carlsbad Caverns. I would love to visit the coastline of Oregon. I want to go to Yellowstone National Park! My next family road trip is to the Gilroy Garlic Festival, then on to Santa Cruz. I’d like to take a road trip to Florida. My husband wants to get to San Simeon so badly. He loves the little park there and the pier. Plus Cambria is such a nice place to visit which is just down the road. I love Moonstone Beach. 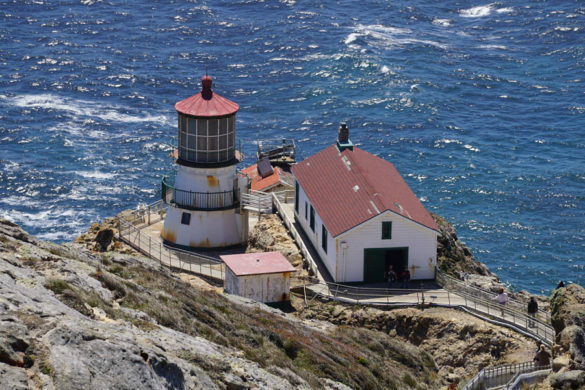 As to this light house, seeing your pictures of it, my husband would go ga-ga to see it. He loves lighthouses. We would make it a point to go a little further north to visit it. I’d like to go to New York City on a road trip, but I know for sure that our next one will be to Chicago. My family and I haven’t taken a road trip in a while now (I’m 29, they’re in their 60s) but we used to drive to the East Coast :). I’m taking a road trip to Grand Haven, MI next weekend with a coworker friend too, it’s about a 3 hour drive. I also was practically raised on Cape Cod chips … yum! Great contest. I would love to go on a road trip to see my sister in California. I have not seen her in a couple of years and I live in Washington state. It would be so much fun! We would like to go to the Oregon Coast. I would like to travel to Virginia. Stop along the way and enjoy the scenery. I love Pt Reyes, but have never gone out to the lighthouse….will have to do that one of these days. I want to go to Santa Barbara for our next road trip. I’m hoping to get to the Maine coast this summer. My fiance and I would love to road trip to either South Carolina or Florida (from NJ)! I would love to go to Niagara Falls to see all the magnificent water power there. I would like to go to Death Valley. That would just be me, maybe a friend or two, my family doesn’t do road trips, I’m the vagabond. My husband and I visited Cape Cod in 1975 and went swimming where Jaws was filmed. Would love to return. I’d like to go to California on my next family road trip! We are planning a road trip to Maine in August. I would like to take a family road trip to the Outer Banks. I want to ride up Route 1 along the Maine Coast and find some new beaches to stop at. I would love to go on a road trip up the california coast line! I would love to go on a road trip to the Outer Banks. I’d would definately like to go to Orlando with my family. We plane to go to the Jersey Shore a lot. On my next family road trip I would love to go to Estes Park in CO. I take a lot of road trips. I think my next trip would be to Texas, Mississippi, and Louisiana. I’d like to go to the beach! We are road tripping to Nashville tomorrow. we LOVE to go to Folly Beach! We will be heading to Carowinds in a week. I would like to go to Charleston S.C. I would like to travel to the New England area. I would love to road trip to the Oregon coast. My family talks about it all the time. I would like to go up the California coast into Oregon. I would like to go to Bar Harbor, Maine. It’s been almost 20 years since I was there last. I would like to head to Yellow Stone National Park. I have never been to New Hampshire, So that’s where I really want to go!! We want to go to Mt. Rushmore and the black hills. Used to live in Arizona and would love to revisit the southwest with a family road trip! I would love to go on a road trip to Rocky Mountain National Park in Colorado. Hoping to go on a road trip to South Dakota to see the Black Hills this summer! We are going to Wisconsin, thank you so much for the great offer! We love chips! I would love to take my kids to the beach in Florida. We would like to go to NYC. I want to take the kids back to myrtle beach!! I’d love to see Bayfield, WI in the fall. Heading to Southern Oregon for jet boating and winery tours. I would like to go to Daytona Beach. We would like to go to Yellowstone National Park. I would like to go to Toronto Canada. I would like to go to Arches National Park. I’d like to go back to the San Diego Zoo. I would like to go on a road trip to Arizona. I would love to go to Washington for my next family road trip. My childhood best friend moved there and I would love to visit her. I want to go to the Grand Canyon on our next road trip. I’d like to go to shenandoah valley. I’d like to go to Yellowstone National Park. I’d love to try through the Rocky Mountains. Would like to go to Florida. It would be nice to visit California! I would love to travel to the gulf coast beaches. I would like to go to Montreal Canada. We would like to take a family road trip to Portland, OR later this summer. I would love to go on a family road trip to florida. I’d love to go to Myrtle Beach. I would love to travel to the Grand Canyon with my family. I’m actually planning on taking a roadtrip to Chicago this fall with my sister. I’d love to go to New Orleans. I’d love to see New Hampshire and Vermont. Fall is too crowded, now is perfect! Its a couple hours drive, leave early! We have never been to California. That is where we would go if we could! I would love to go to myrtle beach on our next road trip. On our next family road trip I would love to go to Palm Desert, CA and visit. We are actually traveling to Florida in about 8 weeks for a cruise, its a 17 hour drive that I will be doing straight thru. Should be interesting!! We want to visit Devil’s Den! I’d like to go to Mt. Rushmore. I’d love to go to the Grand Canyon! There are some really amazing sites here. i would love to take a road trip to CA someday. So many beautiful pictures- I have no doubt that it was a great time! I am actually planning a road trip to Seattle in September. I am so excited! Portland Maine in 2 weeks. The next road trip we’re taking is to Burlington, Vermont. I need to get to Maine so I can finish the Appalachian Trail. I think my next road trip will be to the east coast. I’d like to visit New York City! I’d like to visit all the lighthouses in North Carolina and the attractions in between. Beautiful pictures! I am in San Mateo (just south of San Francisco). 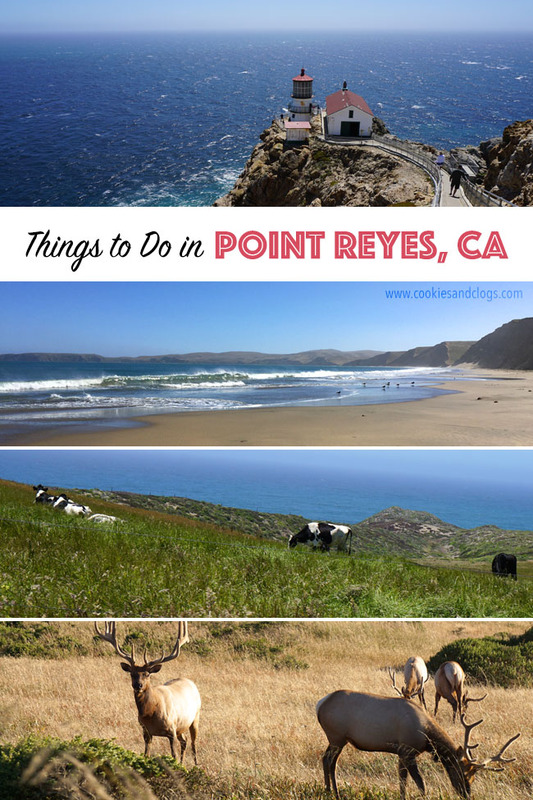 I have heard of Point Reyes before but must admit I don’t know exactly where it is. I will have to check google maps! I also love Santa Cruz for little getaways within Nor Cal. I enjoy the boardwalk and beach, but love the downtown too with all of it’s unique stores, bakeries and bookstores! we are planning a road trip to nashville tennessee. i think it will be a lot of fun. I’d love to go to Florida. We are going on a home trip for my husband to Puerto Rico to visit relatives along with a cruise to celebrate our 25th anniversary. I would like to take a road trip to Ocean City, MD after tourist season, of course! I would love to take the kids to Disney! Hopefully our next road trip will be to a football game. Go Panthers! I’d like to take a trip down to the Florida Keys if I ever get a chance. I’d like to go to Indian Rocks Beach, FL on our next family road trip. On our next family road trip Id love to go to Florida. I would like to go to the Natural bridge in Virginia! Thanks so much for the chances to win. We are going to head down to Georgia on our next road trip, hopefully it will be in August. I would love to go to Destin, Florida. We are planning a beach trip at the end of July to Holden Beach, NC. I would like to go to New Hampshire on our next road trip. WE’d like to go to Zion National Park. It’s cliche but I’d love to go see the Grand Canyon. Thank you! I would like to take a road trip from Oregon to New York! We would like to go to Branson. I’d like to take my family camping in Yosemite. Sooooo beautiful! I would love to go back to the famous Highway 1 in California. I would love to see the Pacific once again. I would love to go to San Antonio, Texas. I would love to go to Florida and soak up the sun! I don’t like road trips much. I get carsick sometimes. I like it best when I go to concerts with my sister. I like doing things with my nieces and nephews but I hate riding in the car with them because they don’t behave very well. I don’t drive. I’d love to go explore around the Outer Banks and see some lighthouses! That would be a fun drive to take! I’d love to go to Memphis this summer. It’s such a neat city and not that far away from where I live! I would like to go to the Grand Canyon on our next road trip. I would love to go to Maine. cANADA to look at colleges. We are road tripping to Pigeon Forge in December. Great pics! We would love to drive to the Outer Banks! To drive through the North West states again and see our beautiful country. Tell me where you’d like to go on your next family road trip. I am thinking a nice drive to Thailand would be nice, just kidding, Reno, do a little gambling, leave the kids in the desert. We are going to be taking a road trip to Hershey Park next month before the kids head back to school. It’ll be about a 5 hour drive for us and we are going to stay overnight. The kids should have a lot of fun! I would like to go back to Biloxi and then go on to Florida. I’d like to take a trip to Chicago and see a Cubs game. i would love to go to the Smoky Mountains in the fall and see the beautiful foliage colors. I want to go to a hiking trail that I have heard about. i would love to go on a road trip to florida! i have never been there! I would love to drive to Disneyland! I would like to go to Orlando. I’d like to go to Disneyworld but knowing my wallet that has to wait a few years, so I would say a road trip up to Mackinaw Island would be great ! I’d like to see Mt Rushmore and then head west to Yellowstone. It would be fun to visit San Diego again!